JP Paulus noted this on the FB page with the image below. Dec. 14th is our respective birthdays and the Chatham 14 theaters is hosting what's described as a holiday party. 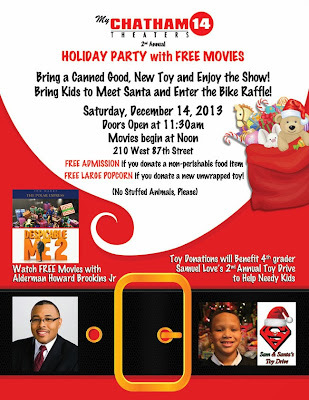 You can either get a free large popcorn or free admissions with a donation of either a toy or an nonperishable item. Of course, you can still bring in a coat for a free large popcorn as well through December 20th as noted on this blog earlier. As always it's great to see a neighborhood business who seeks to engage in charitable activities such as this to the community it serves. Refer to flyer below for more information.